Our skin naturally produces oil to nourish, heal, and protect our skin, so this is a good thing. Unfortunately the mainstream skincare industry’s marketing centers around convincing people that they need to get rid of this protective oil barrier in order to avoid acne, blackheads, skin conditions, and other imperfections, so that oil doesn’t “clog our pores” and create breakouts. What actually happens when we use these products is that our skin gets dried out, inflamed, and generally perpetuates the cycle of skin issues. What happens when your over-dried, irritated skin gets continually parched with these products? It produces more oil to try to repair the damage done by the chemicals in your products. Did I mention that the cost these mainstream products are expensive? That’s great for the conventional skincare industry, not so great for you. Why not spend $13 on my organic lavender-calendula salve instead of $50+ on all the products that sounded amazing in the commercials but didn’t do a thing to help your skin? So de-clutter your bathroom and start oil cleansing! Applying oil to your skin won’t create more blemishes and breakouts, it works to dissolve the oil that your skin has over-produced in the effort to re-hydrate your skin! My best-selling product is my Organic Lavender-Calendula Salve, which contains organic sunflower oil that I have infused with the dried blossoms of the Calendula flower. Calendula is well-known for it’s skin healing properties for all skin types, including people (like me) with sensitive skin. It’s great for kids and elders too! I add organic lavender essential oil, which has anti-inflammatory properties and also works well for all skin types. 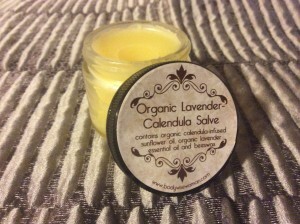 I add a bit of beeswax to get the right consistency of my salve, and voila, the perfect oil cleansing product! Start by wetting your face with warm water, and then apply my Organic Lavender-Calendula salve, and be generous around your eyes to remove any makeup. Soak a wash cloth in hot water, and gently remove the salve. No need to moisturize afterwards, and your skin will look and feel great! Repeat nightly. Before doing the oil cleansing method, I would blot my face throughout the day as my face produced more oil, but now my face stays naturally dry throughout the day. So try it today by clicking here, and I think you’ll agree that oil cleansing with my Organic Lavender-Calendula Salve works!